A colourful dish with seasonal vegetables. Quinoa is high in protein, but you could add a vegetarian sausage if you like (read the label if you have any allergies). Slice the green bell pepper lengthways and rub the outside with olive oil. Grill under a medium grill for around 10 minutes or until the skin starts to darken, but is not black. In the meantime; cook the quinoa following the instructions on the packet. Heat 1 tbsp oil and fry the onion for around 5 minutes until slightly browned. Mix together the cooked quinoa, onion, tomatoes,1 tbsp lemon juice and 1 tbsp nori sprinkle. 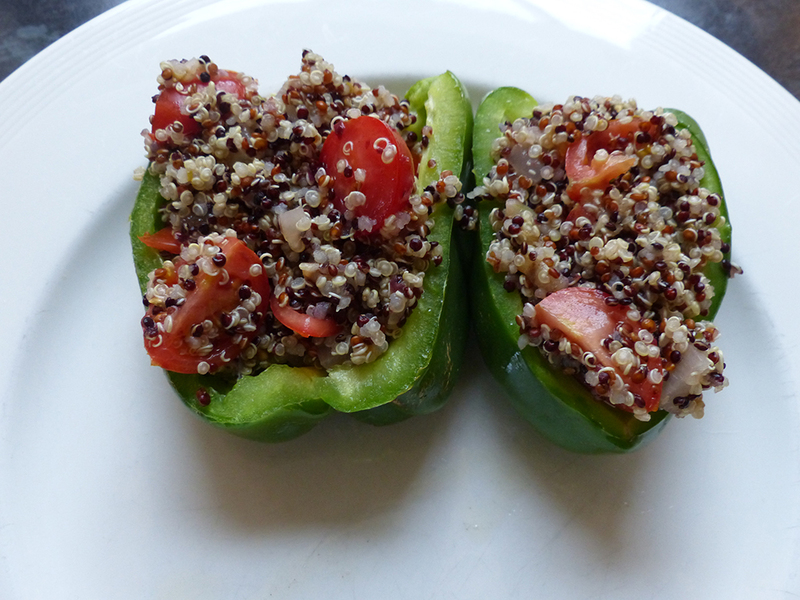 Put the quinoa into the open side of the bell pepper and serve.